Customer satisfaction is the number one priority among service providers. You have to give them the best possible service in order to gain their trust. Dealing with different customers under different circumstances, it’s definitely easier said than done. But in the case of Donna De Los Santos, owner of Delmont Cleaning Services, it really paid off for their cleaning business. 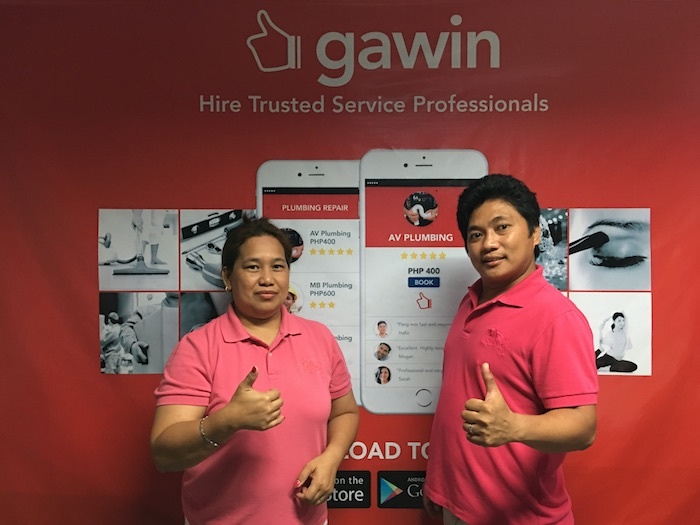 They earned themselves a Gawin Champion badge and currently, they’re one of the top service providers of Gawin. GAWIN: Hi Donna! Why did you decide to put up a cleaning business? I was a vacuum cleaner agent back then (year 1991-1997). It is through this that I have acquired my training and skills on how to clean an entire house. One of my customers asked me to clean their place, but specifically requested to clean it using my vacuum or have it serviced instead of buying it because the vacuum I was selling was quite expensive. Having that experience, my husband and I decided to formally establish our cleaning service business. Delmont Carpet Bed Sofa Steam Shampoo and General Cleaning Services has been completely registered, November of 2014. How long have you joined Gawin and how has that affected your business? We became part of Gawin before the company established its Manila office here in the Philippines. Before joining the platform, I have more or less 7-15 customers per month, but right now, the number of clients more than doubled – having 30-45 clients each month. Instead of personally calling up customers, Gawin already provides a platform for us to connect with customers. And since they have questionnaires where customers can include personal details or conditions, we’re more than ready to take the job because we instantly know their concerns. How does Delmont Cleaning Services differ from other cleaning services? We always guarantee to give the best service to them at all costs. My husband and I personally help the customers to solve their concerns. We always tell them to give us a comment or feedback and in case we miss a few spots, we’ll happily go back to the place to clean them. I believe that through this, we gain the trust of more customers. Delmont has the most number of customer reviews – meaning we get a lot of job orders. Our customers are mostly happy with us. Some of our cleaners even get extra tips and receive gifts from our clients. It just proves that they’re satisfied with our services. What do you love most about working with Gawin? I feel very comfortable working with Gawin because the Gawin team is very supportive of the service providers. They constantly remind us on how we can improve our services further. So, we return the favor – by keeping our trust with each other. Customers feel comfortable and secured when contacting service providers through Gawin. And as a service provider under Gawin, we help in ensuring the satisfaction of customers who use the platform. With our partnership with Gawin, we believe we can achieve more! Want to hire a top-rated cleaner for your place? Head on over to Gawin Direct to instantly book a professional cleaner. All you have to do is select from the pre-designed packages offered at standardized prices, fill in the necessary details, and wait for them to arrive on your doorstep.